Downshifting from affluenza and solving Global Climate Change on a budget. We're getting most of our ideas for the garden out of Toby Hemenway's Gaia's Garden: A Guide to Home-scale Permaculture. Aaron, Kevin and I were standing around looking at the nearly 2 yards of fill dirt Aaron got delivered (free). Aaron said, "I ordered mulch, too, but the arborists put us on a two-week waiting list. What should we do? Should we use this dirt to just fill all the bed a few inches?" "Let me get the book, and see what Toby says," I said. 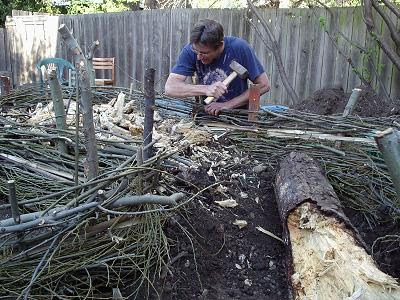 I found this: Hugelkultur is a central European technique of piling up dead wood and brush, stomping it down, adding some compostibles on top, and then topping it off with a bit of compost and an inch of soil. The stuff on the bottom decomposes slowly and acts like a sponge, releasing nutrients as well as providing water. When I trimmed the willow, much of the wood was already rotten and spongy. We decided we'd use the dirt we had so far to make a sort of bathtub shape in one of the lobes of the raised bed, then we broke up and soaked down a fair amount of decomposing willow woood, and buried it under some more dirt. We've now got a bed that's a couple of feet high, with a reservior of water and nutrients sequestered within. "Wow," Aaron said, "all that dirt didn't make much of a bed. I think I'd better get 10 more yards." Is your group receptive, nay, eager, for the inspirational account of how I am collapse-proofing my life and the lives of those around me? How I use permaculture as the antidote to fear and lack? How your neighborhood can strengthen itself and promote well-being? Email bobpixel@gmail.com for public speaking about urban permaculture. What is affordable urban permaculture housing? Objective: Founding an investment and development company to acquire under-utilized investment properties of 2 to 6 units per building and retrofitting and rehabilitating them using sweat equity, green building and urban permacultural principles into "seeds" for eco-villages. We combine expertise from the worlds of green building and architecture, relocalization, social activism and sustainability, rehabilitating distressed investment properties into cores for community-centered living, reshaping the urban environment and offering solutions to issues as small as affluenza to as large as global climate change. Urban permaculture points the way to creating a secure, environmentally sound, and socially just housing model for owner-tenants who are yearning for affordable housing.